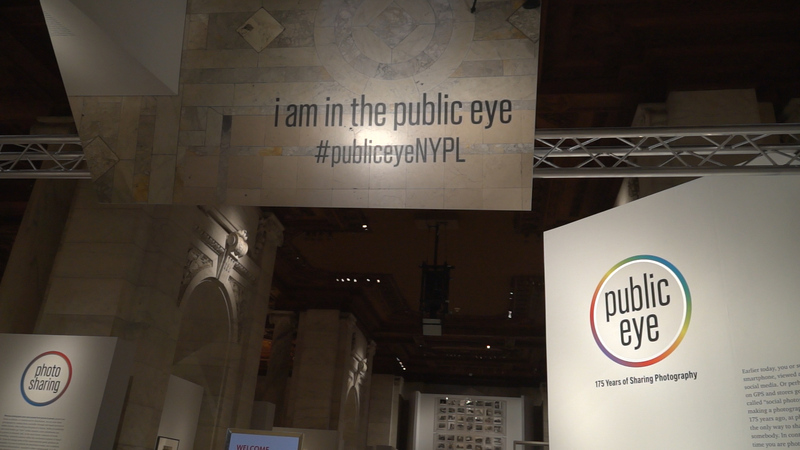 NEW YORK --If a "selfie" is the first picture you take at this New York Public Library photography exhibition, you're doing it right. Walk through the entrance, and the goading mirror above reflects a mantra fixed under your feet: "I am in the public eye." It's one of several ideas the library's curator of photography, Stephen C. Pinson conveys in the "Public Eye: 175 Years of Sharing Photography." The goal, he said, is to look at the history of photography through the contemporary lens of social media. "Despite the fact that we so often hear today about the glut of photography, I think that if you look back at certain moments, there have always been these periodic moments when there's been a flood of images," Pinson said. The exhibition is a celebration of photography's history featuring items from in-house collections like Francis Frith's 19th century "The Queen's Bible" and online photos en masse on the library's Instagram account. The latter may not seem as significant, but the library's assistant curator of photography, Elizabeth Cronin, proposed that some historical photographs now prominently featured in the collection weren't either, but now are. Kodak Brownie photographs compare to today's "casual iPhone photo," she said. "There's one photograph that we have that's just a bunch of women posing. And there's just an inscription that just says 'Posing,'" Cronin said. "It's just a little bit humorous because people were always doing this thing that we still do today and have fun with." There are three thematic sections in the exhibition: "Photo Sharing," which details the history of how photographs have been shared throughout history, "Crowdsourcing" a mix of both traditional and digitally aggregated content to demonstrate how the public has always been the subject of photography and "Street View" which features images from Google's own product of the same name and geological surveys of the American West. It's those 19th century photographs, Pinson said, that serve as reminders to the incredible feats some made to get the perfect shot. "If you go back and think of photographers of the American West like William Henry Jackson or Carlton Watson who were taking these mammoth glass plate negatives on horseback up through uncharted territories up through the American West, it's a very different kind of process than what we think of today, when we sometimes mindlessly take pictures wherever we are," he said. Other collections in "Public Eye," like German photographer Jens Sundheim's slideshow of web cameras from around the world, reflect a change in people's perception of photography. He has appeared in over 400 live-streamed locations, from cow pastures to museums. Sundheim's work is not the least bit high definition, but his message is clear. "You start thinking about all the strange places in which there are public cameras that have live webfeeds that anyone can see," Cronin said. Pinson also featured two interactive components. Visitors can scroll through the entire length of one of New York's most popular streets with "On Broadway" and explore public data like geotagged pictures, Four Square check-ins and even the median income in each area. The "Stereogranimator" provides visitors an opportunity to view historical stereographs in 3D, as well as create and share their own. Cronin said photography today is more pervasive than ever, and it will only continue to grow. "It's always been the case, whether you have an online image gallery of your family, or you make a scrapbook, the human urge is still always there, but it's kind of impossible to predict what kind of direction that will take," Cronin said. Want to see more? Check NY Public Library's "CBS This Morning" Instagram takeover here.